Come out and enjoy the fall with Heritage Day at Churchville Schoolhouse and Fischer Farm in Bensenville on Saturday, October 13. There will be lots of good, old-fashioned, family-friendly activities at both locations. Listen to music from a century ago, learn how to square dance, have a pony ride and much more! This delightful day of family fun is brought to you by the Elmhurst History Museum and the Bensenville Park District. At Elmhurst Toyota, we think the annual Heritage Day at Churchville Schoolhouse and Fischer Farm could be a wonderful autumn tradition for your family, and we encourage you to attend. On Heritage Day at Churchville Schoolhouse, you can play old-fashioned games, participate in crafts and learn lessons from a 1910 schoolmarm. The Muddy Creek Band will perform toe-tapping music to get you out on the dance floor for some square dancing. Hear the beautiful voices of the Conrad Fischer School Singers, who will also perform. Complimentary refreshments are available while they last. 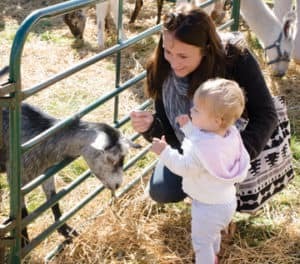 Enjoy all these fun family activities for free from 11 a.m. to 3 p.m.
At Fischer Farm, you can taste old-time candy from the Yesterday Sweets Store, learn how to make a braided rug, visit the pumpkin patch and go for a hayride or a pony ride. Food and beverages will be available for purchase. Most activities are free, but a wristband is needed to access the pumpkin patch, pony rides and the petting zoo. The weather on Saturday is forecast to be cool and dry, so bundle up the kids and come out for Heritage Day at Churchville Schoolhouse and Fischer Farm! Churchville Schoolhouse: 11 a.m. to 3 p.m.
Fischer Farm: 10 a.m. to 4 p.m. Admission is free at Churchville Schoolhouse. A wristband is required for some events at Fischer Farm. Wristbands for children ages 13 and under are $6 and include one pumpkin from the pumpkin patch (while supplies last), pony rides and unlimited visits to the petting zoo. Wristbands for adults and children ages 14 and up are $2. Call 630-833-1457 or visit http://www.elmhursthistory.org/321/Special-Events.